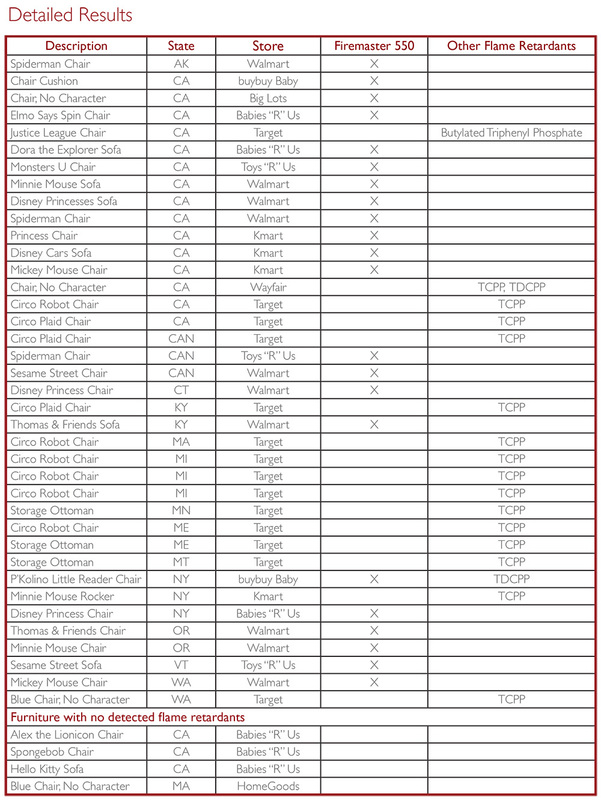 Test results from the Playing on Poisons report (Nov. 2013) found harmful flame retardant chemicals in children’s chairs, couches and other kids’ furniture purchased from Walmart, Target, Kmart, Toys “R” Us/Babies “R” Us, buybuy Baby and other major retailers throughout the U.S. and Canada. Read the full report. Firemaster 550 caused obesity and disrupted normal hormone function in tests with laboratory animals and tests with living cells. TCPP caused genetic damage in studies of human cells. In tests with laboratory animals, TCPP changed the length of the menstrual cycle. TDCPP (chlorinated Tris) is identified as a cancer-causing chemical by the state of California and the U.S. National Research Council. In laboratory animals, it is toxic to developing embryos and also causes genetic damage in studies of human cells. In men attending infertility clinics, exposure to TDCPP was linked with changes in hormone levels. Butylated Triphenyl Phosphate: The U.S. Environmental Protection Agency has summarized the limited toxicology testing done with this flame retardant mixture. Health concerns identified in the EPA summary include decreased fertility and abnormal menstrual cycles. Click here to view image of table.